Background: The unilateral cleft lip and palate is the most common orofacial deformity. While the cleft through the lip and palate is the most obvious component to it, adjacent structures are also affected. 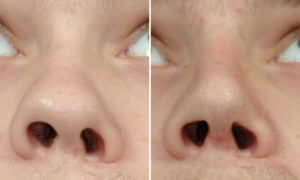 This is very apparent in the nose with the classic depressed and widened nostril on the cleft side. The correction of the cleft nasal deformity has been approached at multiple time periods. Some advocate an early tip rhinoplasty at the time of the primary cleft lip repair while most delay it until the early school age years. But regardless of when it is done, it is inevitable that a more definitive septorhinoplasty procedure is needed when most of the growth phase is more complete. The cleft rhinoplasty is challenging, not only because most of the nose is affected, but the distortions at the nasal tip reflect a tissue shortage. The cleft nasal tip side has a nostril distortion that is a four sided deformity. The medial columella is tilted and short, the alar rim is pulled down, the nostril side wall is widened and pulled superiorly and the nasal sill floor contracted inward. Case Study: This teenage male was born with a left cleft lip and palate deformity. He had been through primary lip and palate repairs followed by a tip rhinoplasty at age seven. As a teenager his overall nose shape had a widened tip with cleft-sided nostril asymmetry. The nasal tip sloped to the cleft side and the nostril floor was lower than he non-cleft side. Under general anesthesia an open septorhinoplasty was performed. The removed septal cartilage was used to create a midline supported columella and to augment the repositioned left lower alar cartilage. The remaining cartilage was also used to build up the nasal sill. The nasal bones were also narrowed on both sides. 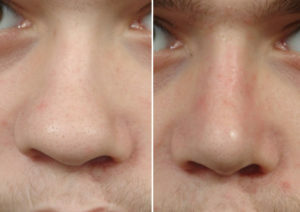 His three month postoperative results showed an improved nasal tip shape with better nostril symmetry. The key to improvement is the strong inverted v-shape cartilage construct created to both lift and resist postoperative downward scar contracture. 1) Cleft lip and palate deformity technically should be called cleft nose-lip and palate deformity. 2) Almost all cleft deformities with nasal involvement require a rhinoplasty procedure in their teenage years. 3) Strong tip support with cartilage grafts is needed to which the depressed nasal side can be reconstructed.